There are many moments when humor and religious contexts end up resulting sad outputs. Some play with snakes, some with crocodiles just for the sake of an ultimate selfie or a crazy video. But what happens at the end is unimaginable, it is known that there are hundreds of cases where people ended up dying while trying to take some most impossible selfies. However, it must be noted that there are certain limits for fun or other and the limit is safety first. 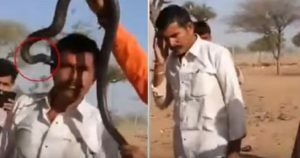 Here, in this case, Jodhpur, a snake charmer foolishly ended up the tourist’s life while trying to take a selfie with a cobra, in the process he claimed some religious contexts on the occasion of a festival trying to put the poisonous cobra around his neck. According to the footage, the snake charmer was attempting to put the poisonous cobra around the tourist’s neck while many others gather around to watch and capture it on their phones. The serpent slithers and strikes out, biting the tourist on his neck. And according to the video, Baburam Jakhar, the man victim was unable to identify the snake bite at the moment. It was only after few minutes, Baburam asked the snake-charmer if he has been stung. However, the entertainer ignored him and carried on with the acts as if nothing has happened or it might be that he haven’t noticed. Later, Baburam fell unconscious and was taken to the nearby hospital, as the situation worsened he was hurried to the hospital where he was declared as ‘brought dead’. The snake-charmer was arrested after the police were informed.